#1. This week's number one is an experienced former international forward Renaldo Balkman (203-84, college: S.Carolina, currently plays in ASEAN League). He led his Filipino team SM Beermen to a victory over one of league's weakest teams Mono Vampire (2-11) 110-100 in the ASEAN League last Sunday. Balkman was MVP of the game. He recorded a double-double by scoring 38 points and getting 10 rebounds. Balkman also added 7 assists and 4 steals. San Miguel Beermen (9-2) is placed third in the ASEAN League. It was his team's first victory after three consecutive loses. Balkman has individually a very good season with high stats. He averages: 25.7ppg, 11.8rpg, 3.4apg, 1.5bpg, 1.7spg, 2FGP: 60.2%(97-161), 3FGP: 38.1% and FT: 74.5%. Balkman has a dual citizenship: Puerto Rican and American. He played for the Puerto Rican senior national team three years ago. Balkman used to play for Guayama in Puerto Rican league. #2. Second place goes to an international guard Gary Browne (185-93, college: W.Virginia, currently plays in Israel). He was the main contributor in an Ironi Nes-Ziona's victory against one of league's weakest teams Ironi Nahariya (4-10) 103-93 in the Israeli Winner League on Saturday night. Browne was the best player in that game. He scored 28 points (!!! ), had 4 rebounds and dished 6 assists in 26 minutes. Ironi Hai Motors Nes-Ziona (7-8) is placed sixth in the Winner League. Browne has relatively good stats this year: 14.7ppg, 6.1rpg, 4.9apg, 1.1spg, 2FGP: 44.6%, 3FGP: 42.6% and FT: 77.0% in 14 games he played so far. He is another player who holds two passports: Puerto Rican and American. Browne is in the roster of the Puerto Rican senior national team. He used to play for Coamo in Puerto Rican league. #3. The Puerto Rican player who performed third best last week abroad was an international swingman David Huertas (195-87, college: Mississippi, currently plays in Mexico). Huertas contributed to a 2-point Fuerza Regia's victory against the second-ranked Mineros (24-9) 85-83 in the Mexican LNBP (second division) in Friday night's game. He was the top player that evening. Huertas scored 22 points. It was the game of the round between two top 3 ranked teams in group North. Fuerza Regia Monterrey (26-7) is placed first. It was his team's tenth consecutive victory in a row. It's Huertas' first season with the team. This year he has very high stats. Huertas averages: 18.3ppg, 3.3rpg, 3.5apg, 1.3spg, 2FGP: 48.5%, 3FGP: 41.9% and FT: 77.9%. He is also a member of the Puerto Rican senior national team. #4. Guard Gian Clavell (193-93, college: Colorado St., currently plays in Spain) contributed to an easy victory against the league outsider Gipuzkoa (3-14) crushing them 86-62 in the Spanish Liga Endesa last Sunday. Clavell was the top player that evening. He scored 22 points and grabbed 4 rebounds in a mere 16 minutes; quite an impressive performance considering it's only Clavell's second season in pro basketball. Movistar Estudiantes Madrid (7-7) is placed eighth in the Liga Endesa. This year Clavell has relatively solid stats: 13.4ppg and 2.3rpg in 16 games. He is also Puerto Rican national team player. #5. International forward Carlos Lopez-Sosa (208-90, college: UNLV, currently plays in Mexico) could not help Angeles (10-21) in their last game on Thursday. Despite Lopez-Sosa's very good performance the seventh-placed Angeles (10-21) was defeated 86-80 at home by the higher-ranked Aaguacateros (#3) in the South group. He recorded a double-double by scoring 27 points and getting 10 rebounds. Lopez-Sosa also added 3 assists and 5 steals. This season Lopez-Sosa has very high stats. He averages: 16.8ppg, 7.9rpg and 2.8apg. Lopez-Sosa plays currently for the Puerto Rican national team. #6. Center Peter Ramos (222-85, currently plays in ASEAN League) is a teammate of previously mentioned Renaldo Balkman. But that was another game of his team in ASEAN League which we would like to mention. Ramos contributed to an easy victory against the eighth-ranked Westports MD (5-6) crushing them 85-47. He was the top player that evening. Ramos had a double-double by scoring 25 points and getting 11 rebounds. He also added 2 blocks in 21 minutes. San Miguel Beermen (9-2) is placed third in the ASEAN League. They ended the series of three consecutive loses. Ramos has very impressive stats this year: 18.8ppg, 10.5rpg and 3.5apg in 11 games. He has both American and Puerto Rican nationalities. Ramos is a former international player as he played for the Puerto Rican senior team three years ago. He used to play for Criollos de Caguas in Puerto Rican league. #7. Former international point guard Shabazz Napier (185-91, college: Connecticut, currently plays in NBA) was the major contributor in a Brooklyn Nets' victory against the New York Knicks (10-37) 109-99 in the NBA last Friday. Napier recorded 18 points. The Brooklyn Nets have 27-23 record this season. It was his team's sixth consecutive victory in a row. Napier has reliable stats this season: 9.0ppg, 1.8rpg and 2.0apg. He also holds two passports: Puerto Rican and American. Napier used to play for the Puerto Rican national team three years ago. Strangely he has never played in Puerto Rico. #8. Power forward Ramon Clemente (200-85, college: Wichita St., currently plays in Argentina) contributed to an easy victory against the 13th-ranked Penarol (4-6) crushing them 104-55 in the Argentinian La Liga on Thursday night. Clemente scored 10 points and grabbed 8 rebounds in 15 minutes. San Lorenzo de Almagra (10-0) is placed first in the La Liga. So far his team won all ten games in the Regular Season. But this is still an early stage of the season and everything may happen. This year Clemente's overall stats are: 5.0ppg and 4.5rpg in two games. He holds both American and Puerto Rican passports. Clemente plays currently for the Puerto Rican national team. He used to play for Indios de Mayaguez in Puerto Rican league. #9. International point guard Carlos Rivera (187-83, college: Hofstra, currently plays in Mexico) is a teammate of previously mentioned David Huertas and both played together in the last Mexican LNBP game. Rivera contributed to a 2-point Fuerza Regia's victory against the second-ranked Mineros (24-9) 85-83. He scored 9 points, grabbed 5 rebounds and dished 8 assists (was perfect 6-for-6 from the free throw line). Rivera's stats this season are: 12.1ppg, 2.9rpg, 4.8apg and 1.3spg. He is also in the roster of the Puerto Rican national team. #10. 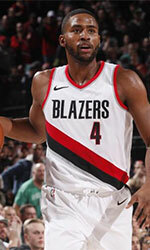 Swingman Maurice Harkless (203-93, college: St.John's, currently plays in NBA) contributed to an easy victory against the New Orleans Pelicans (22-27) 128-112 in the NBA in Friday night's game. Harkless scored 12 points in 21 minutes. The Portland Trail Blazers have 30-20 record this season. Harkless has been at the team for four years. This year his total stats are: 5.9ppg and 3.9rpg in 30 games. Harkless holds both American and Puerto Rican passports. He is a former international player as three years ago he still played for the Puerto Rican senior national team. Apparently Harkless has never played in Puerto Rico. #11. Former international point guard Filiberto Rivera (189-82, college: UTEP, currently plays in Mexico) is a teammate of previously mentioned Carlos Lopez-Sosa. However that was another game of his team in Mexican LNBP which brought him to that list. Rivera contributed to Angeles' victory against the sixth-ranked Libertadores 84-76. He scored 18 points, had 6 rebounds and dished 7 assists. Rivera averaged so far 12.5ppg, 3.2rpg, 5.0apg and 1.1spg. He used to play for the Puerto Rican national team five years ago. #12. Former U18 international shooting guard Ethan Thompson (197-99, currently plays college basketball in the States) contributed to an Oregon St.'s victory against the Washington State University 90-77 in the NCAA in Thursday night's game. He recorded 20 points, 4 rebounds and 6 assists. Thompson averaged so far 13.8ppg, 5.0rpg, 3.0apg and 1.1spg. He holds both American and Puerto Rican passports. Thompson used to play for the Puerto Rican U18 national team back in 2016. Interesting that he has never played in Puerto Rico. #13. Former U18 international shooting guard Wil Martinez (188-92, college: Fairmont St., currently plays in Chile) was not able to help Osorno Basquetbol (9-15) in their last game. Despite Martinez's very good performance Osorno Basquetbol (#6) was badly defeated 105-89 on the road by the second-ranked Los Leones in the Conferencia Sur. He was the top scorer with 23 points in 32 minutes. Martinez has very impressive stats this year: 21.5ppg, 3.0rpg and 2.0apg in two games. He holds both American and Puerto Rican passports. Martinez used to play for the Puerto Rican U18 national team nine years ago. He played also for San German in Puerto Rican league. #14. Former U19 international guard Jesus Cruz (196-98, currently studies in the States), who plays in the NCAA was not able to secure a victory for the Fairfield (2-5) in their last game on Saturday. Despite Cruz's very good performance his team was defeated 73-68 in Buffalo by the Canisius College. He scored 21 points and grabbed 6 rebounds. Cruz has averaged so far 10.0ppg, 4.9rpg and 1.6apg. He used to play for the Puerto Rican U19 national team back in 2017. #15. Former international forward Christopher Ortiz (203-93, agency: Inception Sports, college: Kent St., currently plays in Finland) couldn't help Helsinki Seagulls (9-12) in their last game. Despite his good performance Helsinki Seagulls was crushed 102-80 on the opponent's court by the higher-ranked (#5) Joensuun_Kataja. Ortiz had a double-double by scoring 12 points and getting the same number of rebounds. He also added 3 assists in 34 minutes. Ortiz has very impressive stats this year: 15.9ppg, 6.1rpg and 1.6apg in 19 games. He holds both American and Puerto Rican passports. Ortiz used to play for the Puerto Rican national team two years ago. He played also for Santurce in Puerto Rican league. #1. Experienced Walter Hodge (183-PG-86, college: Florida, currently plays in Lebanon) led Homentmen to a victory over the closely-ranked Byblos (4-6) 103-95 in the Lebanese LBL in Monday night's game. He was MVP of the game. 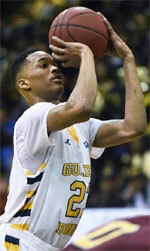 Hodge had a double-double by scoring 29 points and making 10 passes. He also added 6 rebounds (was perfect 9-for-9 from the free throw line !!!) in 28 minutes. Homentmen Beirut (7-2) is placed third in the LBL. Hodge's team will play only one more game in the Regular Season. And that game will be critical. Hodge has individually a very good year with high stats. He averages: 20.0ppg, 4.1rpg, 6.9apg and 1.3spg in nine games he played so far. Hodge has a dual citizenship: U.S. Virgin Islands and Puerto Rican. #2. Kyle Vinales (185-G-92, college: Cent.Conn.St., currently plays in Cyprus) was the main contributor in a AEK Larnaca's victory against the closely-ranked Etha (5-9) crushing them 84-64 in the Cypriot Division A last Saturday. Vinales was the top player that evening. He scored 18 points and added 4 passes (was perfect 5-for-5 from the free throw line) in 30 minutes. Petrolina AEK Larnaca (10-3) is placed second in the Division A. Vinales' team will play only one more game in the Regular Season. And now that game is very crucial. Vinales has very impressive stats this year: 18.3ppg, 2.7rpg and 2.1apg in 13 games. He is another player who holds two passports: Puerto Rican and American. Vinales used to play for Bayamon in Puerto Rican league. #3. Stephen Thompson Jr. (193-G-97, currently plays college basketball in the States) contributed to an Oregon St.'s victory against the Washington State University (2-5) 90-77 in the NCAA on Thursday night. He recorded 22 points, 6 rebounds and 7 assists. The Oregon State University has 3-2 conference record this season. Thompson Jr. is one of the most experienced players in a team as it's his fourth year in Oregon St.'s roster. This season Thompson Jr. has very high stats. He averages: 15.2ppg, 4.6rpg, 3.9apg and 1.6spg. Thompson Jr. has both American and Puerto Rican nationalities. Apparently he has never played in Puerto Rico. #4. Jhivvan Jackson (183-PG, currently studies in the States) contributed to an easy victory against the University of North Carolina - Charlotte (2-4) crushing them 88-43 in the NCAA on Thursday night. Jackson recorded 28 points (!!!) and grabbed 4 rebounds in 30 minutes. The The Univ.of Texas - San Antonio has a solid 4-2 conference record this season. Jackson has very impressive stats this year: 21.3ppg, 3.5rpg, 2.2apg and 1.3spg in 17 games. #5. Benito Santiago (198-F-89, college: Cumberlands, currently plays in Chile) could not help Espanol de Talca (4-4) in their last game. Despite Santiago's very good performance Espanol de Talca (#3) lost 72-83 on the road to the lower-ranked (#3) Universidad de Concepcion in the Conferencia Centro. He was the second best scorer with 20 points. Santiago also added 3 steals in 32 minutes. There are only two games left until the end of the Regular Season. So now every game will be important. Santiago has very impressive stats this year: 18.8ppg, 5.1rpg and 3.7apg in 16 games. #6. Emanuel Ubilla (188-PG-86, agency: Court Side, college: Fair Dickinson, currently plays in Hungary) contributed to Kaposvari's surprising victory against the fourth-ranked Falco-Vulcano 90-84 in the Hungarian A Division last Saturday. He recorded a double-double by scoring 12 points and getting 11 rebounds. Ubilla also added 3 assists. Ubilla averaged so far 14.6ppg, 6.3rpg, 3.4apg and 1.4spg. He also holds two passports: Puerto Rican and American. Ubilla used to play for Atleticos de San German in Puerto Rican league. #7. Neftali Alvarez (188-G, is currently at the American university), who plays in the NCAA was not able to help the Fairfield (2-5) in their last game. Despite Alvarez's good performance his team lost 48-57 in Loudonville to the Siena College. He recorded 10 points and grabbed 7 rebounds in 30 minutes. Alvarez's stats this year are: 12.0ppg, 3.8rpg, 3.3apg and 1.6spg in 20 games. #8. Jojo Walker (185-G-97, currently plays college basketball in the States), who plays in the NCAA was not able to secure a victory for the Portland (0-5) in their last game on Saturday. Despite his good performance his team was crushed 89-66 in Spokane by the Gonzaga University. Walker scored 11 points and added 7 assists. Walker averaged so far 12.3ppg, 3.6rpg, 3.7apg and 1.1spg. #9. Miguel Arnold (180-PG, currently plays in NCAA2) contributed to an easy victory against the Young Harris College crushing them 134-93 in the NCAA2 on Monday night. He recorded 16 points in 24 minutes. Arnold's stats this year are: 11.5ppg, 2.1rpg and 1.5apg in 13 games. #10. Ebube Ebube (201-F-97, currently plays college basketball in the States) couldn't help the Manhattan in their game against the Rider University in the NCAA. He cannot count Saturday's game as one of the best ones. Ebube scored only 2 points in 15 minutes. His team lost 47-60. Ebube has averaged so far 4.5ppg and 4.6rpg in 18 games.